Throughout December The British Film Institute is showing Yvonne Rainer’s feature films alongside an exhibition of her work and inspirations, what better time to talk about her. As an artist with integrity, you have to be prepared to follow your line of enquiry to the end wherever it may take you. This very situation stared me in the face three years ago, and it was heartbreaking to realise that my love affair with painting was over. After basing my identity, and whole world around striving to be the next great painter, I had fallen for another art form – dance. What is more I wasn’t trained in it and I was 25. However, as anyone who has fallen out of love will know, you just can’t ignore that pull of something that makes you feel life is meaningful again, offering you possibility to move forwards. So in 2008 I shut the studio door, leotard in hand and ran away with dance. Yvonne Rainer similarly moved from dance to film. She was co-founder of The Judson Church during 1960’s in New York, where she first became intrigued by the relationship between the performer and audience, the political and the private in everyday life. In the 1960’s she rocked the conventions of the dance world, introducing pedestrian movement and using people as props. Her works were task based and looked to the uneducated eye, like someone doing Ballet badly. In 1975 she left dance for film altogether, after a several yearlong affair, during which she had merged the two. Key works from this period, AG Indexical with a Little Help from HM and RoS Indexical are on show at the British Film Institute currently alongside seven of Rainer’s feature films. RoS Indexical is her take on The Rite of Spring, and AG Indexical with a Little Help from HM is her take on Balanchine’s Agon. Her films reflect her radical and outspoken nature. They explore alternatives to the conventions of plot and character development and are full of social contradictions: gender, feminism, racism, political violence, housing, sexual identity, inequality, ageing and disease. Rainer reacted against the drama of Martha Graham and found the alternative Minimalist approach that was available at the time just didn’t fit her media (the body). She found that anywhere there were people, there were hierarchies, there was empathy and there was humanness. She saw the truth of the situation and the conflicts between the thinking of the great men that surrounded her. And in that place of contradiction, duality and politics, she chose to situate her work for most of her career. She did in fact, free dance as far as it could be freed. It raised the question, still relevant today, that an art form should be valued for more than it’s wow factor. Dance is not a rare being for you to ogle, it is a media used by artists, and that is a very different thing. I had the privilege of hearing Yvonne Rainer speak at the MOVE: Choreographing You Weekend. I was sitting next to a group of dancers who were working as ‘activators’ in the MOVE exhibition, and performing Rainer’s piece Trio A. On the other side of me was Susan Sentler, who was also dancing in New York when Rainer was making Trio A, and like Rainer, trained under Martha Graham. The two poles couldn’t have seemed further apart in my mind. Susan seemed to be chuckling every now and then and later explained that there was a lot of American humour in her talk that I missed. It made me realise how many assumptions we make when someone appears to be speaking the same language as us. American is in fact not English, although it does sound similar. What Yvonne does with dance, could be easily misunderstood if one was to try and read it in terms of what we know as dance. I know quite a few ballet dancers, and the work that they put into their careers is phenomenal. It is a lifetime dedicated to the conventions and elite ability of centuries of tradition. 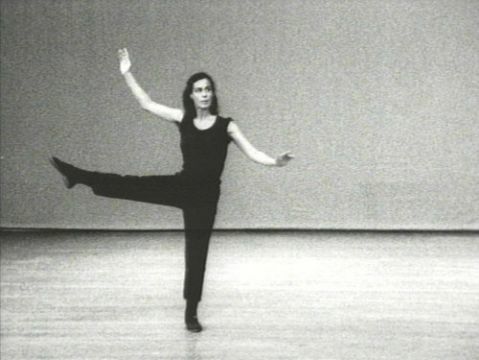 Yvonne Rainer’s refusal to look up to the institution could still anger dancers today. Still with courageous integrity, she risked this, to be true to her fascination with spectatorship. Yvonne is not flamboyant, she has a deadpan manner that is disarming and also makes her quite a formidable figure. She also had an ability to ask disarming questions, as she did at points throughout the weekend. ‘No to spectacle no to virtuosity no to transformations and magic and make believe no to glamour and transcendency of the star image no to the heroic no to the anti-heroic no to trash imagery no to involvement of performer or spectator no to style no to camp no to seduction of spectator by the wiles of the performer no to eccentricity no to moving or being moved’. Influenced by Minimalist art, which sought to make art an object above all else, Rainer was interested in the body as an object. One that could be treated without feeling or desire, and could even be manipulated like an object if it stopped moving itself. However she found that while an object could have a relationship with the audience that wasn’t ‘political’, when a person was involved it was a different story. The undeniable potency of a person being present, straight away created a performer/spectator relationship. This brought the work firmly back to human territory where emotion, empathy, and power all come into play. Rainer tried at first to break this relationship by instructing that the eyes of the performer must never meet those of the audience, the should not use their gaze in a dance way, that is to project their ‘dance self’ to the audience. She realized how politically charged the gaze of the spectator was and she went on to explore power in relationships through film, seven of which are currently on show at The British Film Institute. This show gives you a chance to experience some of these key works alongside her seven feature films and a new work After many Summer Dies a Swan: Hybrid (2002).In this latest work she uses a series of literary excerpts, to do with the decline of the Austro Hungarian Empire in Vienna, set against a dance commissioned by her by the Baryshnikov Dance Foundation in 2000. The piece is set in the round and you can follow it round the walls on a chair with wheels, dancing with the other viewers as you go.